Toilet bowl cleaners are synthetic and commercially-available solutions used in cleaning toilets. These are generally caustic in nature and may release obnoxious gases/fumes on mixing with water. Toilet Bowl Cleaner Poisoning is the accidental or intentional intake of any product containing the compound. The exposure may be through skin or eye contact or following an ingestion of the chemical. What is Toilet Bowl Cleaner Poisoning? What are the Causes of Toilet Bowl Cleaner Poisoning? What are the Signs and Symptoms of Toilet Bowl Cleaner Poisoning? The signs and symptoms of Toilet Bowl Cleaner Poisoning can vary from one individual to another. It may be mild in some and severe in others. Several systems of the body, such as the digestive system, respiratory system, vascular system, nervous system, urinary system, skin and ENT may be affected. How is First Aid administered for Toilet Bowl Cleaner Poisoning? Who should administer First Aid for Toilet Bowl Cleaner Poisoning? 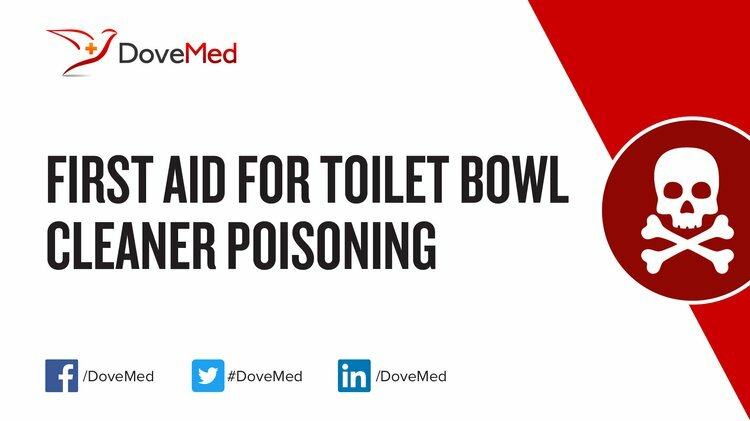 First aid for Toilet Bowl Cleaner Poisoning is administered by healthcare professionals. What is the Prognosis of Toilet Bowl Cleaner Poisoning? How can Toilet Bowl Cleaner Poisoning be Prevented? Hession, R. M., Sharma, V., Spiegel, D. E., Tat, C., Hwang, D. G., Dieppa, M., ... & Stüve, O. (2014). Multiple sclerosis disease progression and paradichlorobenzene: a tale of mothballs and toilet cleaner. JAMA neurology, 71(2), 228-232. D’Cruz, R., Pang, T. C., Harvey, J. G., & Holland, A. J. (2015). Chemical burns in children: Aetiology and prevention. Burns, 41(4), 764-769. Van Hoof, J., Kort, H. S., Van Waarde, H., & Blom, M. M. (2010). Environmental interventions and the design of homes for older adults with dementia: an overview. American Journal of Alzheimer's Disease & Other Dementias®, 25(3), 202-232. El Ghandour, S., & Sharif, Y. (2010). Household Products Survey: HAAD Poison and Drug Information Center. World Family Medicine Journal: Incorporating the Middle East Journal of Family Medicine, 8(9), 20-25. Induce vomiting when non-corrosive, B. first aid measures for poisoning. Remedios, I. CARE presentation 6/9/15. Sanitizer, A. P. F. MSDS Table of Contents. Campbell, D. Household Cleaning with Essential Oils. Signorelli, J. W., Osbun, J. W., Arias, E. J., Reynolds, L. C., Chyatte, D., & Reynolds, M. R. (2016). Self-injection of household cleaning detergents into a ventriculoperitoneal shunt reservoir during a suicide attempt: a case report and literature review. Acta neurochirurgica, 158(9), 1655-1660.